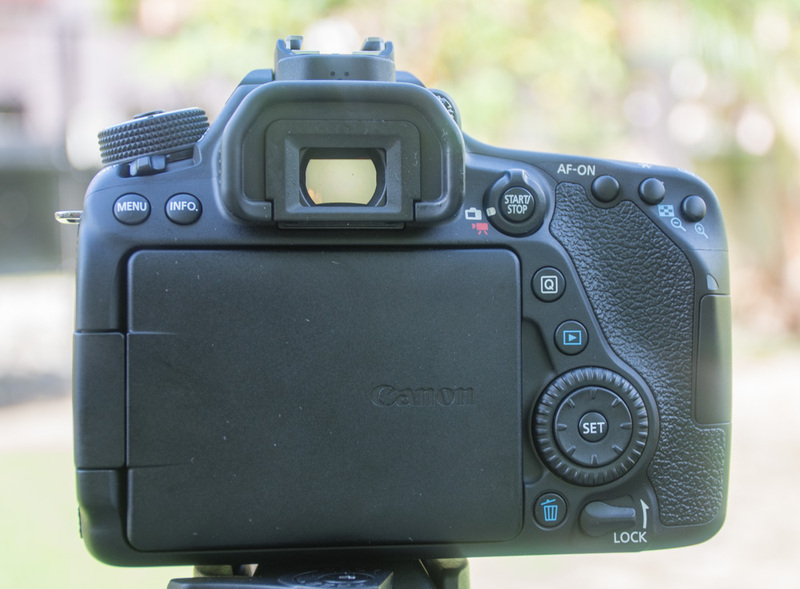 Welcome to our Canon EOS 80D review. The Canon EOS 80D is a mid range DSLR featuring a new 24mp APS-C sensor, 7 FPS continuous shooting along with a 45 point AF system and full HD 1080/60p video. The Canon 80D comes about 3 years after the 70d which is in line with Canon’s standard release schedule with XXD bodies. The Canon 80D is a step up from entry level cameras offering a more fully featured body and better build construction for those seeking more control while not wanting the size, weight and cost of professional DSLR’s. The most interesting points of note with the Canon 80D is the new 24mp sensor which promises better resolution, low light performance and importantly for Canon when competing against Nikon’s D7xx series bodies, better dynamic range. The new 24mp sensor like that of the 20mp 70d employs Canon’s dual pixel CMOS AF technology allowing 80% of the pixels on the sensor to act as phase detect AF points. This in theory allows for smooth continuous AF in live view and video mode. It has been upgraded from the 70d to work with all lenses and all video quality settings. We will take a look to see what the updated technology has to offer. The new 45 point AF system now features all cross type AF points, with 27 working at F/8 and all of them now focusing down to -3EV. Along with a fully articulated touch screen and WiFi the 80D now features NFC for quick connections to smart devices. We tested the Canon 80D alongside the new 18-135mm Nano USM kit lens which is supposed to offer both the speed and smoothness of focusing of STM lenses for movies while keeping up with USM lenses for Stills. Having used a Fuji X100T for a lot of shooting in recent years there is something substantial and reassuring about handling the Canon 80D. There is no doubt that the ergonomics of a DSLR are pretty much near perfect when it comes to photography. The camera feels very solid in the hand yet it doesn’t feel too heavy to shoot for extended periods of time. The grip is substantial and allows you to confidently hold the camera in one hand, something not always true of mirror-less bodies. 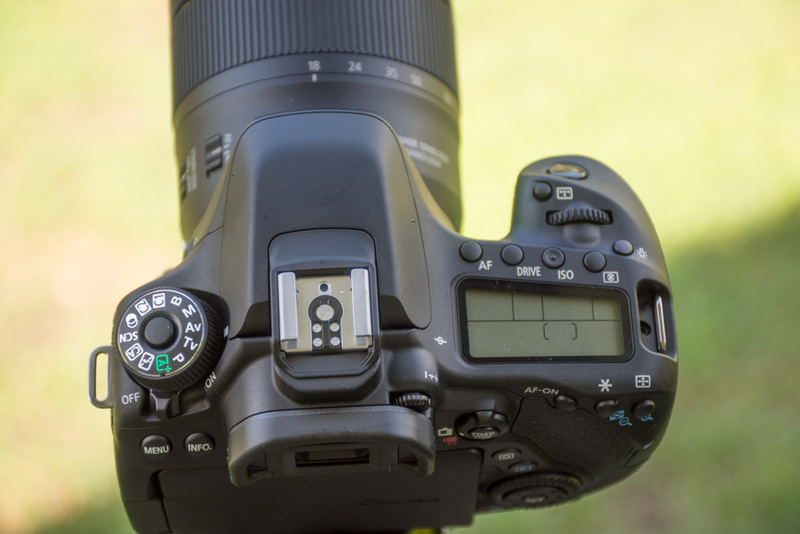 The first thing we notice about the Canon 80D as we switch it on is that it has retained the position of the on/off switch on top of the body just behind the PASM dial. We hate this position a it prevents us from turning the camera on while holding it one handed (ala Nikon bodies). However it is a small gripe as once turned on you can just leave it that way and rely on the camera to enter sleep mode to save battery life. The battery used for the Canon 80D is the same as all the newer Canon bodies, the LP-E6N 1865 mAh. Our first charge gave us 686 shots but that included a lot of playing with the menus and setting up the camera as well as shooting numerous short videos. Our subsequent charges gave us around 1000 shots each time. More than enough for a days shooting. With the new 18-135mm Nano USM kit lens attached the camera feels well balanced and at 730g it is substantial but doesn’t feel overly bulky like the 7D mk II (910g) can. 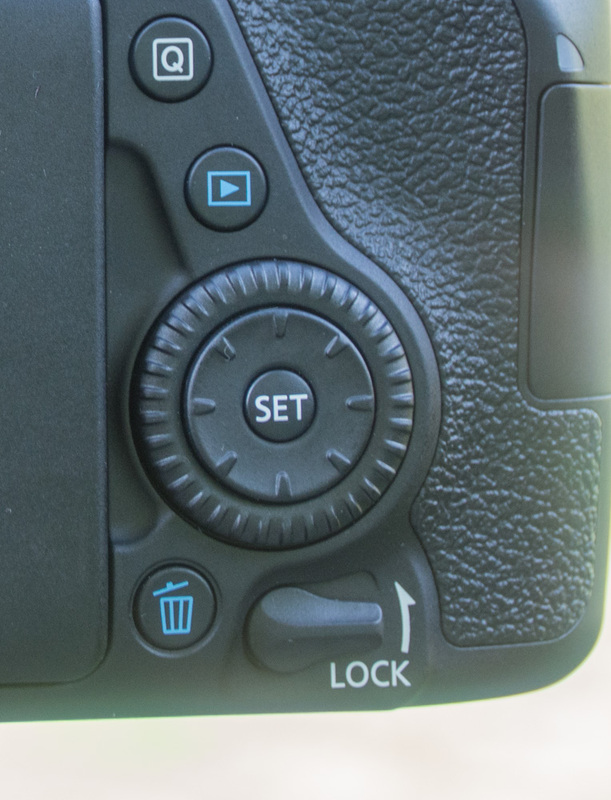 If you are used to shooting Canon bodies then the 80D will feel reassuringly familiar with similar button layout. There is no AF joystick which you get on the 7dmkII but instead we have the ability to use the articulated touch screen for quick focusing in video and live view modes. However that doesn’t help when shooting stills through the optical viewfinder. 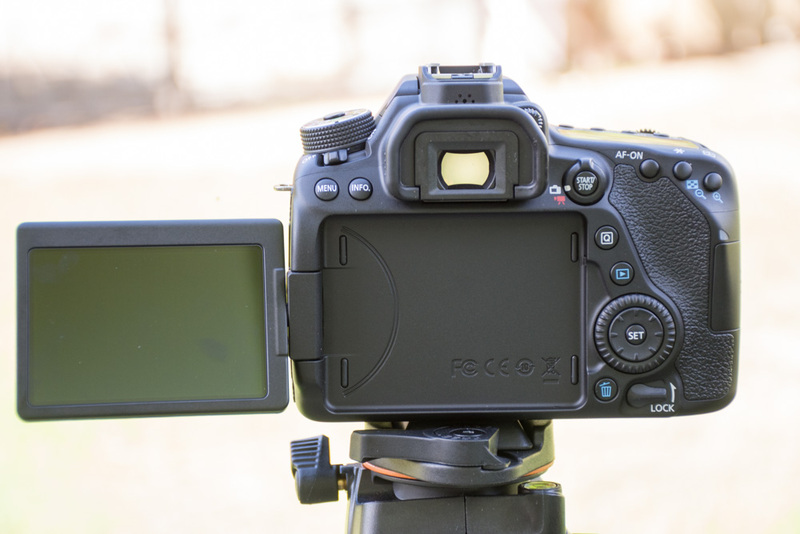 On the top of the camera body we have the display screen giving quick access to your settings along with dedicated buttons to change AF, Drive modes, ISO and metering, as well as a button to light up the display. A little further forward we have the control dial and a further button to quickly change focusing mode. In front of that is the shutter release button. All the buttons feel well made, solid and give positive tactile feedback for easy use with your eye to the viewfinder. The only issue we have with the controls are the on/off switch placement (as previously mentioned) and the D-pad on the rear of the body which is somewhat obstructed by the control wheel around it. It just doesn’t feel natural when using it as the wheel is a little too deep and obstructs your thumb from getting purchase on the D-pad. Taking a leaf out of Fuji’s book we have a Q button on the reverse which gives quick access to your most regularly used features and functions. We really like this as we can quickly change settings without having to either delve in to the menus or use Canon’s customisable My Menu tab, which lets be honest is a bit rubbish. Dedicated live view/video button, AF-on, zoom, playback . delete, control wheel lock, menu and info buttons round out the layout on the back of the camera body. The mode dial on top now features two programmable custom modes which is always a welcome feature. The new viewfinder is crisp, clear and now offers 100% viewfinder coverage, up from 98% on the 70D making composition much better with the 80D. It also offers diopter adjustment, always good for users of eye glasses. 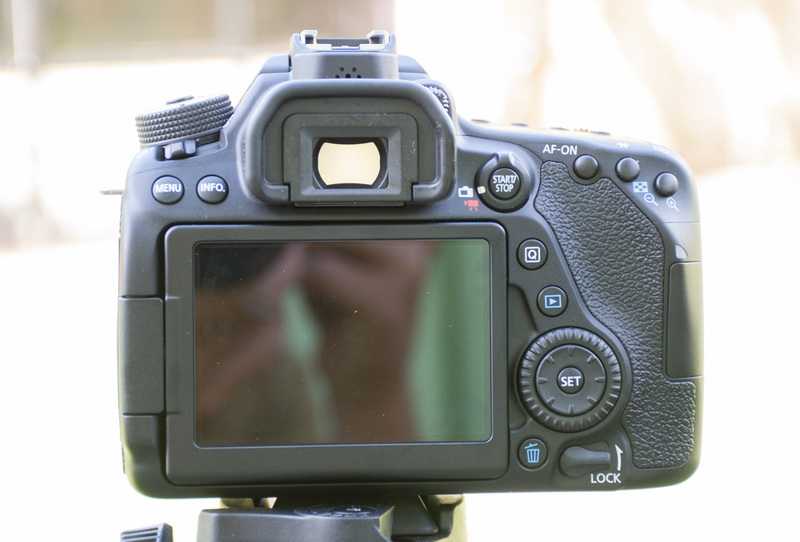 The Canon 80D like its predecessor features a fully articulated touch screen. Some people bemoan articulated screens however we really appreciate them. It is easy to underestimate just how useful they are for composing shots in unusual angles and combined with the touch screen it is a fantastic tool and one that video enthusiasts in particular will appreciate. If you don’t like an articulated screen (and we don’t know why you wouldn’t once you have used one) you can simply flip it in to the body, screen facing out and use it as a standard fixed screen. Alternatively if you are shooting using only the viewfinder you can close the LCD altogether with the glass facing the body and know that it is protected from scratches and damage. The articulated screen is very flexible in terms of how you choose to use it. We found the articulated screen one of the best features of the 80D and wish that Nikon would implement it on their D7xx series of bodies. One disappointment is that the Canon 80D only takes a single SD card. We would have liked Canon to take from the Nikon D7xx series bodies which have had dual SD card slots for some time now.